On the eve of group draws that signal the start of the 2011-12 season, a new era of growth in European basketball was celebrated Wednesday night with the inauguration of the recently completed Euroleague Basketball headquarters in Barcelona, Spain. An estimated 200 representatives from across the breadth of the European basketball family joined in festivities that symbolized the consistent expansion that the sport has achieved since Euroleague Basketball was founded in 2000. Now in just its second decade, Euroleague Basketball is more dedicated than ever to continue helping clubs and leagues bring the unique game of European basketball to more and more fans every season. "The new offices of Euroleague Basketball answer to one simple reality: the growth of our league:" Euroleague Basketball CEO Jordi Bertomeu said. "Growth that has been accomplished in small steps, with plenty of debate; growth that has carried European basketball to 192 countries thanks to agreements with television broadcasters who have shown confidence in us; growth that has tripled the revenues of the company, thanks to the cooperation of our sponsors and partners; growth that has happened, too, in our arenas, where our club have also bet on future growth by building bigger venues and filling them. Congratulations are in order. The work of our clubs and our national leagues has taken us this far -- and will carry us much further." In between meetings of the competition assemblies and boards on Wednesday and the draws for the Turkish Airlines Euroleague and Eurocup on Thursday, basketball officials from almost every country in Europe were on hand to tour what will be the home of the sport on the continent going forward. "Today, in the name of the clubs, its owners, we offer you this new home," Bertomeu told the guests. Among the invitees to Wednesday's inauguration were three very special guests: eight-time Euroleague champion coach Zeljko Obradovic, four-time Euroleague champion player Sarunas Jasikevicius and two-time Euroleague Final Four MVP Dejan Bodiroga. All three will enjoy a strong connection with the new Euroleague Basketball headquarters, whose main meeting rooms have been named in their honor. Obradovic, who will receive the Alexander Gomelskiy Coach of the Year trophy tomorrow, said: "I am very proud about this. Only one coach was chosen and this is a reward to all the players I worked with throughout the years, not only for me. That is the way I see it. I am very happy and proud about it. We all hope that this building will be the house of all of us working in basketball who love the Euroleague project. We hope the Euroleague keeps getting better in all aspects in the near future." Jasikevicius, the only player ever to conquer the continent with three different clubs - Barcelona in 2003, Maccabi in 2004 and 2005, and Panathinaikos in 2009 - said: "It is something you never expect and it's truly unbelievable. I feel very fortunate. Being here with these two guys, both true champions, makes it even more special. I feel very honored. I am very thankful to the Euroleague." Bodiroga, who won the Euroleague twice with Panathinaikos, in 2000 and 2002, and once with Barcelona, in 2003 - said: "I really like this a lot. I think that the Euroleague needed something like this after so many years. Congratulations to the Euroleague for its success. We hope this building will be our home for many years. Having a room here named after me is a great honor. I worked hard, like a lot of people, to make the Euroleague better. It is a pleasure to be part of the Euroleague family and a great honor to have something like this." 2017 Final Four standard tickets sold out in record time! 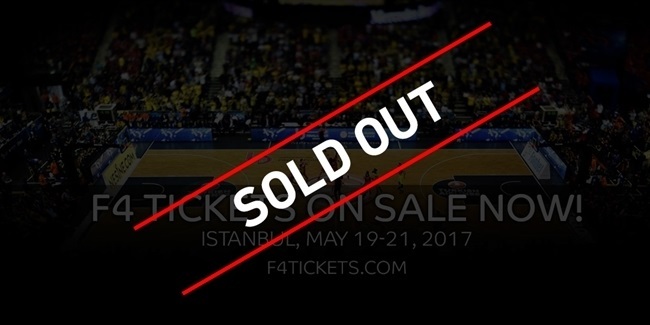 An unprecedented response from fans has seen all general public tickets for the 2017 Turkish Airlines EuroLeague Final Four sold out on Monday in record time.